We have recently relocate to Dubai and will be here for two years. After one month plus of house hunting, school searching etc, we are more or less settled down. Weather is getting hot by the day and the air is very much drier than what we had in Singapore. Frequent moisturiser is something we need to get used to. Moving from high rise flat to a double storey villa is something exciting for both parents and our cute little girl and boy. There is so much to explore and hide and seek has become their favourite pastimes. With a garden, we now are able to place our slide and bicycle outside the house. 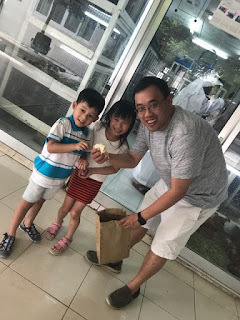 Having a pet has been the kids dream and we previously had a goldfish which unfortunately left us after our house switch tripped during a thunderstorm in Singapore while we are in Taiwan.